We had a yellow tilefish for dinner the other night and I wanted to extend the seafood theme into a side dish. 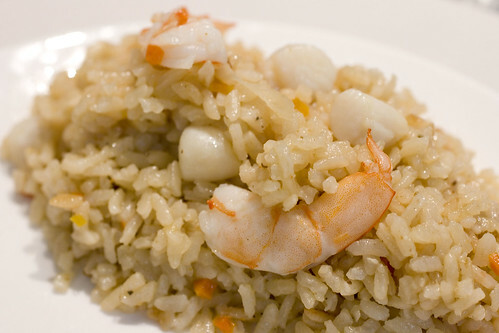 So I came up with a new seafood rice side dish. I wanted the flavor to be all American, but I didn’t really want it to be southern. This was actually a hard target for me, since most rice recipes I know are foreign or southern. In the end, I think this worked out pretty well and was easy. Especially, since I used frozen seafood, that we had on hand. In a large skillet, heat oil over low heat. Saute onions and carrots with salt until carrots soften. Season with Old Bay. Stir in rice, cook until some rice becomes opaque and chalky. Deglaze with vinegar. Stir in Worcestershire. Add a cup of stock (or water) and raise heat to medium-high. Stir well. When stock has mostly been absorbed/evaporated, add enough stock to cover the rice by at least 1/2 inch. reduce heat to low and cover. Cook about 15 minutes. Uncover, stir/fluff rice, and taste for done-ness. Usually it will need to cook further. Add additional stock, about 1/2 to 1 cup at a time to finish cooking, it should be just cooked and not very soft. 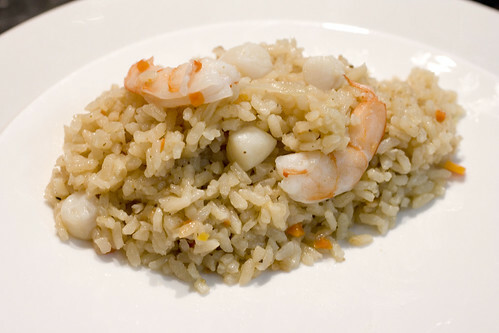 When rice is done, turn off heat, add seafood, stir together, cover, and let sit about 5-10 minutes before serving. posted by Lon	at 08:03 AM	Filed under American, Recipes. You can follow any responses to this entry through the RSS 2.0 feed. Both comments and pings are currently closed.